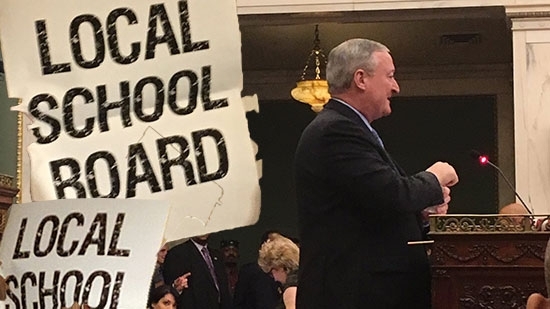 Philadelphia Mayor Jim Kenney addressed City Council on Thursday morning calling on the dissolution of the School Reform Commission (SRC). The commission will vote on a resolution to dissolve at a meeting on November 16th. The SRC was created in 2001 when the state of Pennsylvania took over control of the Philadelphia School District to provide additional resources and financial stability. The mayor now wants to return full control of schools to the city after 16 years of mixed results. Currently, the state fills 3 of the 5 seats on the commission. Kenney would create a nine person School Board that would be filled by the mayor's office. City Council is expected to seek a city charter change to give them some oversight of the mayor's appointees. That change would have to be voted on by Philadelphia voters. The earliest opportunity would be the May 2018 primary. Kenney hopes to have his choices selected by the end of the winter. If the SRC is dissolved, the change over would happened at the end of the school year June 30th, 2018. Philadelphia would not only take on full responsibility of the 130,000 children, but the impending $1 billion deficit. Major hurdles in the budget include pension costs and charter schools. Pennsylvania Governor Wolf approves of local control. Authorities are investigating after the body of a man was found floating in the Delaware River near a park in New Castle, DE. A work crew cutting back weeds saw the body in the water near Battery Park on Chestnut Street. Police believe the man was in his 20's and may have been in the water for a while. The medical examiner will perform an autopsy to determine cause of death and make an identification. Anyone with information is asked to call New Castle City Police at 302-322-9800. Camden County authorities have identified the suspect arrested and charged with shooting a police officer at point blank range on Wednesday night. 19-year-old Delronn Mahan of Lindenwold is in custody and charged with attempted murder, aggravated assault, and weapons offenses. The incident happened last night at 10:15 p.m. near 9th and Chelton Streets. Officer Patrick O'Hanlon approached a group of men. Mahan took off running and the officer gave chase. After a short distance, the officer and Mahan were engaged in a struggle and Mahan pulled out a gun and shot O'Hanlon in the leg. O'Hanlon managed to wrestle the gun away and hold the suspect until other officers arrived to arrest him. Those officers tied a tourniquet to stop the loss of blood and took O'Hanlon to the hospital. He is expected to recover. Mahan is being held without bail at Camden County Correctional Facility. He was out on bail for several pending cases. He already has three felony convictions and has been arrested 10 times.